1. 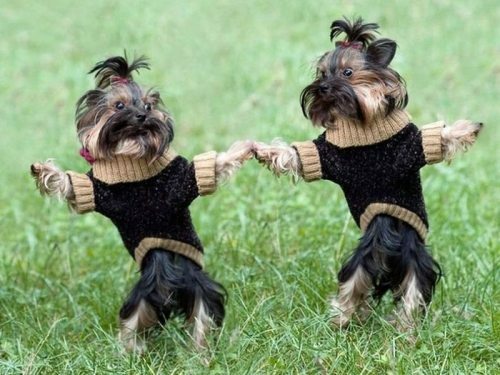 Astaire and Rogers have nothing on these two as they dance cheek to cheek (and paw to paw and wet nose to wet nose). 2. Chihuahua Cha-Cha. Be one with the rhythm. 3. Twerking is all about working that tail. 4. The original 'Tap Dog'. 5. I'll just be over here, busting a move. 6. Doing the superhero shuffle. Start with the best headbanging hounds and rock out to some heavy sounds! 7. When dancing is in your blood, anything becomes your dancefloor. 8. Wiggle, wiggle, wiggle, wiggle, wiggle yeah! 9. Yeah dawg, I'm breaking out my hip hop style. Haters keep hatin'. 11. Feeling that sweet, slow groove. As cool as a pooch can be. 12. Dance like no one's watching... Oh, and stop your dance if someone's watching.